You’d be surprised at how common this is. It’s a huge missed opportunity for companies and websites. The problem for these businesses is figuring out what to send to their customers or subscribers. If this is you, then today’s article will help you. It’s all about different kinds of email blasts and how to send them out. An email blast is just a single email that you send out to a huge group of your subscribers. Email marketing gurus go on and on about segmentation, “tagging” subscribers, and funnels. 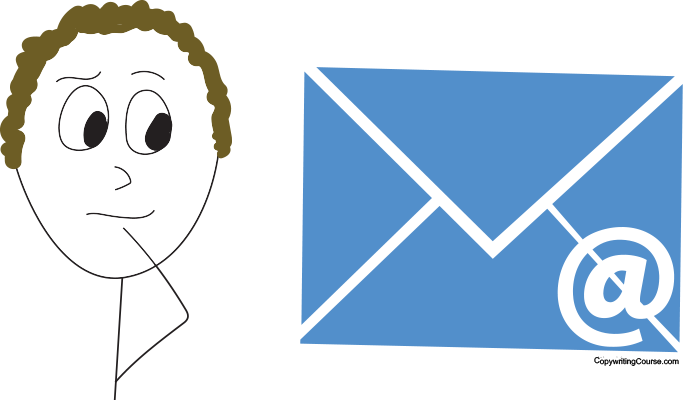 If you are an email expert, then that stuff can work for you. But for the average business owner, all of the advanced email marketing talk will just leave you confused and frustrated. For most companies, it would be a big help just to get their customers’ email addresses, and send customers interesting emails on a regular basis. The way you do this, is with an email blast that goes out to all the subscribers on your email list. Everyone is obsessed with growing a social media following right now. Getting lots of likes and followers feels good, but does it actually help business? You need to look at the numbers. To figure out the return on investment (ROI) for your marketing, you have to figure out how many people actually see your message. In social media lingo, this is called reach. Let’s look at the numbers for, on average, how many of your followers on Facebook will see your posts in their feed. Here are some of the stats Hootsuite shares about “reach” of Facebook posts. Then let’s compare that to some of the “benchmarks” or average numbers for open rates Mailchimp shares on its website. Even video Facebook posts get barely half as many viewers as a popular email! This is a great reason to send email blasts on a regular basis to your subscriber list. If you go even closer and look at engagement on a social media post, then the “email vs social media” battle begins to look…one-sided. Check out the difference between how many people engage with your post on social media vs. how many people click a link in your email. Facebook has the highest average engagement rate in the data above, and email click rates are still three times higher. Now you can see that having an email strategy is a great idea for a business or anyone who wants to have an “audience.” But what do you actually send out to your list? The different email blasts below all have different purposes. But the people who send them are smart, so you can bet they know exactly why they send email blasts the way they do. Sometimes you just want to send out a whole blog post for your subscribers to read. This is a good move if you mostly care about building a loyal readership. The downside is that you won’t get lots of traffic to your site because people just read the post in their email browser. Lots of Internet “straight shooters” take this approach, like James Clear, Seth Godin, Erik Barker, Cal Newport, and Leo Babauta of Zen Habits. 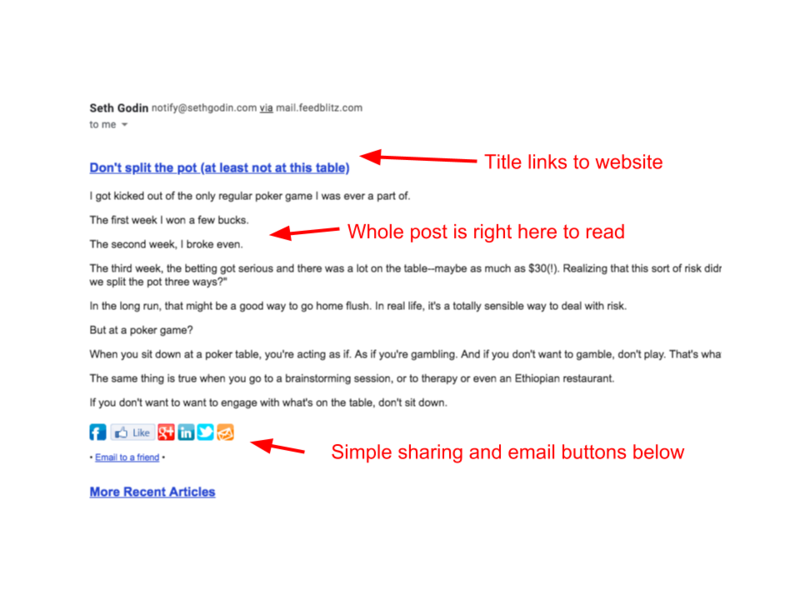 Seth Godin sends a full blog post via email blast every day. 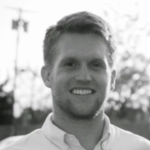 If you want to put a little more time into your email blast, then send an email blast like Brian Dean. Every time he makes a new YouTube video or blog post, he sends out an email to give his readers a preview of the content. This kind of email blast can use casual copy that sounds like an email from a friend. The goal is to “tease” the reader into clicking the link and going to the video or article. This gives you more traffic on your website and can lead to more social shares of your content. Brian Dean sends email blasts when he puts out a new post or video. The types of content that are popular changes based on what people need and want. Right now, every body is busy and overwhelmed because of all of the digital content available to them, and all of the information that they get slammed with every day. This is one of the reasons that curated content newsletters are becoming really popular. This is a type of email blast that companies usually send everyday or once a week. The basic idea is that the writers gather up all of the important stories in a specific area (tech, business, sports) and then present a short version of the stories in a fun and informative way. The Hustle is a popular example of a curated content newsletter. They send an email blast every day to their subscribers. The email has several tech/business news stories written in a fun, cool style that millenials like. They put ads in the newsletter and include some sponsored posts to make money. The Hustle sends an email every day with their own spin on news stories. 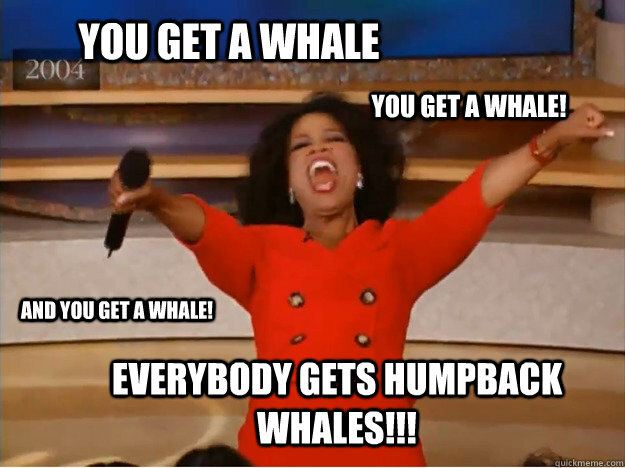 You don’t even have to share a car or a humpback whale with your subscribers to make them like your emails. If your audience trusts you and wants to hear from you, they will love it if you just send them a bunch of interesting links in an email blast. Right now, the Tim Ferriss newsletter called 5-Bullet Friday is a prefect example of this. 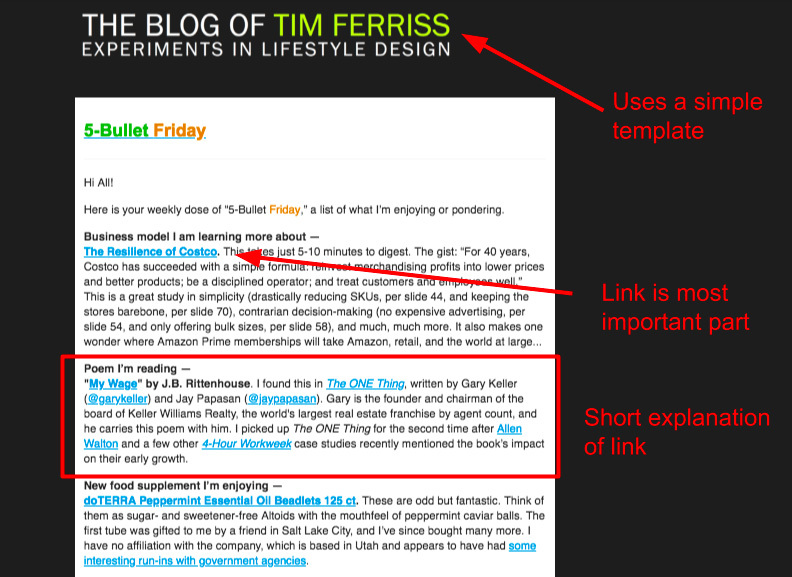 Tim claims that his newsletter has an insanely high open rate because people love seeing the links that he shares. There are many stories of websites crashing because so many people click the links in his emails. This just shows that you don’t have to send tons of content in an email blast. You just have to share content that people actually want to receive. Tim Ferriss gets a bajillion clicks on his emails because people love the stuff he shares. ConvertKit – Made especially for bloggers or “creators” as they call it. SendFox – Email service provider made by the guys at Sumo. Constant Contact – An OG tool for sending email blasts that is popular with small businesses and other organizations. MailChimp – Started off as the go-to for people just starting an email list. Now, MailChimp is good for small businesses because they are adding more and more basic ecommerce functions to their site. You can also make digital ads for Facebook and other platforms right on the same site that you write your email blasts. Aweber – Email service provider who emphasizes their good customer service. Drip – Used to be used by a variety of online business owners like people selling courses, now marketed specifically to ecommerce store owners. Email blast = email sent to a huge group of your subscribers, usually the whole list. Why send an email blast? Social media platforms always change. 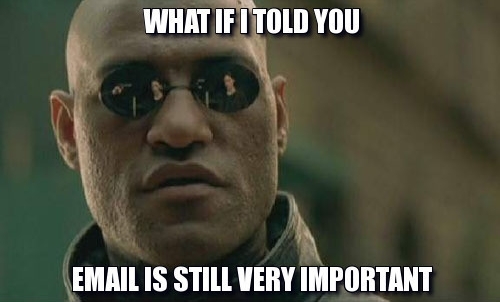 Email has been basically the same for a long time. New blog post email: Just send the whole post. Used by Seth Godin, James Clear and more. Good for readers, bad for website traffic. 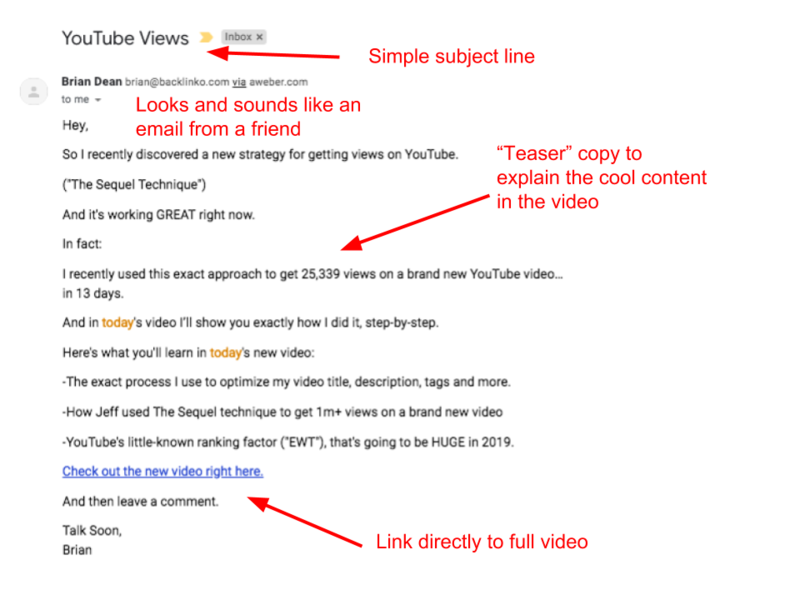 Blog post/YouTube preview email: Send a “teaser” of your new content. Used by Brian Dean, Noah Kagan, Neville Medhora. Fewer people read the whole post, but you get more website traffic. 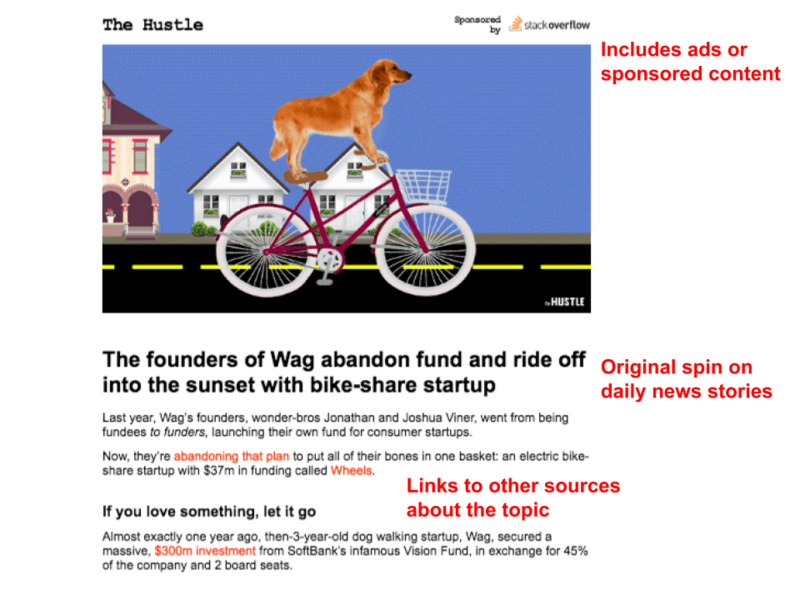 Curated content newsletters: Share your spin on popular news and stories. Very popular right now because of companies like The Hustle and The Skimm. Sharing cool links email blast: Find cool products, articles, videos, etc and share them with your subscribers. Write a short description and send it off. No wonder the only emails I look forward to getting are from Seth, Tim, Noah and Nev! Rob – yea, it looks like they’re doing something right. Thanks for the kind words man!